The following security objects are required to use eForms. No security is required for the eForms published to particular user types (Staff, Students, Caregivers) Quicklinks control. They appear their by default when selected to display. 510 eForm Admin This security allows the user to create and delete eForms. It should only be allocated to a small number of users who are responsible for the creation and deletion of eForms. It does not allow the user to search through completed eForms. 511 eForm Search This security allows the user to search for completed eForms. This security restricts the user to see eForms which they have completed, or they are a nominated controller within the eForm. If they have the “Delete” aspect of this security checked, it will allow the user to delete responses from the search control. 512 eForm Search All This security allows the user to search through ALL eForms, regardless as the whether they are a controller on the eForm or not. If they have the “Delete” aspect of this security checked, it will allow the user to delete responses from the search control. 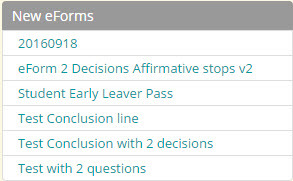 The following eForms are appearing in the Alert Dashboard because they have Staff checked for “Display eForm in Spider Quicklinks for:” No security is required for the staff member to select these eForms.